How to describe the RedTail Catfish? A monster of the deep? A gargantuan bottom feeder? A wide-mouthed beast? All things I have heard when referring to this magnificent creature. I, however, prefer to describe it as big and beautiful with enormous fish keeping appeal! The last of their genus, the RedTail Catfish is believed to date back over 13.5 million years. They are a widely sought after game fish with the IGFA, (International Game Fish Association) recording the biggest ever caught weighing in at 123 lbs or 56 kilos. This titan of a catfish was caught by Giberto Fernandes in the Amazon river in 2010. Easily distinguishable by the red featured on its dorsal fin and tail, the RedTail Catfish is a peaceful fish with other species of its own size. Anything smaller than itself, however, will definitely become lunch! Care of the RedTail Catfish is not particularly hard, but they do require huge tanks of a 1000 gallons plus. They also eat an incredible amount of food as they grow bigger even though it’s only once a week! Both of these factors make this catfish not only too big for most standard homes but also too expensive to care for! Unfortunately, due to the above, many RedTail Catfish end up being donated to local aquariums or being dumped in local rivers. This is mainly due to them outgrowing their home tanks and has now got to be such a huge problem that many aquariums have no room for any more. They are also classed as an invasive problem fish in many river systems. 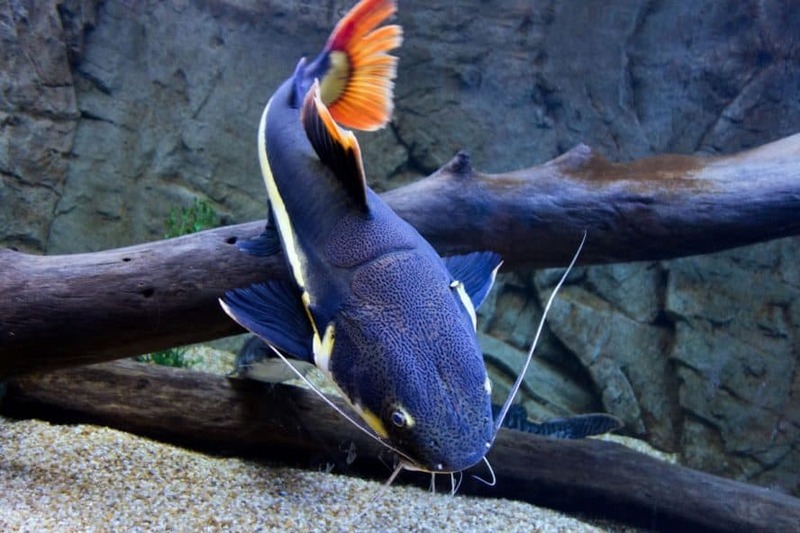 The Red Tail Catfish has an arrow-shaped cylindrical body with a flat belly and laterally compressed tail. Its mouth, as wide as its body, is shovel like with long whiskers/barbels protruding from the bottom. The eyes are set on either side of the head at the top and even on the larger specimens appear quite beady. Of course, recognized for its reddish-orange that appears on the tail and tip of the dorsal fin the RedTail Catfish is also distinguishable by its horizontal stripe of white that starts just below the lower part of its mouth and runs down the entire body. In juveniles this stripe is unbroken whilst in older specimens, it becomes broken just before the mouth. The rest of the Red Tail Catfishes body is brown to grey with small darker spots and a beige underbelly. 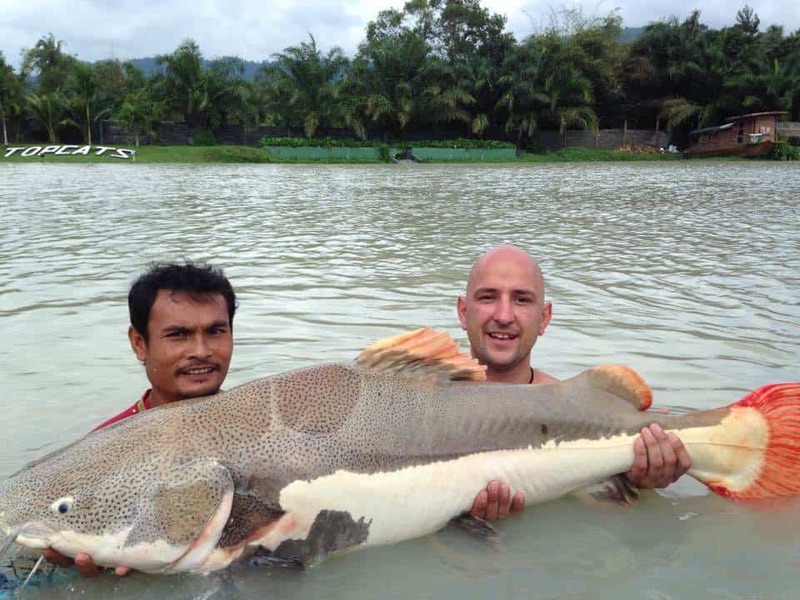 Usually offered for purchase at around 4 CMS there is nothing telling in the viewing of the RedTail Catfish that would lead you to believe it will grow to the gargantuan size that it does. Once you get it home, however, and in your aquarium, it will be capable of growing up to an inch per week. These monsters of the aquarium can top out at an incredible three plus feet! Where do Redtail Catfish come from? The RedTail Catfish is found naturally in the Amazon, Orinoco and Essequibo river basins of countries such as Colombia, Venezuela, Guyana, Ecuador, Perú, Bolivia and Brazil. Here, although preferring the deep pools found in the rivers, they can be found in a range of habitats. These include rapids and flooded forests where they spend most of their time motionless on the river beds. Not unsurprisingly, due to the irresponsible dumping of the RedTail Catfish, there are also large invasive populations of this fish in Florida, Nebraska, Missouri, Tennessee, and Texas. Recently they have also been discovered in the river systems of Thailand. The RedTail Catfish has not been assessed for the IUCN Red List. These Catfish are fished by many anglers as they are a tough catch due to their size. Often putting up a good fight and using their 3-foot length and strength to test any competent angler. The RedTail Catfish is a little contradictory when it comes to its behavior. It is both peaceful and aggressive, dependent on the circumstances it finds itself in. Placed with fish species that are of a similar size it will be amiable; smaller and it will be predatory and aggressive. Placed in an aquarium by itself or with suitable tank mates the RedTail Catfish is shy and fairly inactive. They will spend most of their time lazing on the bottom of the aquarium or hiding out in caves or dens. More interaction can be encouraged, however, by spending time with your RedTail Catfish and letting them get used to your presence. Some even become outgoing enough to hand feed. With a well developed chemosensory and stealth ability the RedTail Catfish is a predatory fish that lies in wait for prey. They can easily eat anything that is up to half the size of them but may even try for bigger. Choking is a fairly common side effect of these attempts, but being able to spit things out is a well known RedTail Catfish trait. Some people have reported to being witness to their RedTails eating rocks which they can then spit back out at any given time. When it comes to the care of the RedTail Catfish, the first thing to consider is the aquarium size that these giants of the river need. If you cannot house one at its maximum size of around 3 feet in captivity, you really should not be considering purchasing one! These catfish grow fast, up to an inch per week, and a smaller aquarium will only be a VERY temporary home. Requiring at least 1000 gallons but preferably nearer to 1500, the RedTail Catfish aquarium will not be suitable for most homes. This does not, however, rule you out from keeping one as an outside pond, the larger the better, is also ideal. Keep in mind that the RedTail Catfish needs temperatures of 68-79℉ or 20-26.1℃ so may require a pond that is heated. If this is the case, they may also need bringing into a warmer environment during winter so you will need somewhere appropriate to keep them. Financially, not only do the size of aquariums required by a RedTail Catfish run into the thousands of dollars price tag, but also the actual care of them can mount up financially too. Heating, filtration and the huge amount of food that the RedTail Catfish can consume will all be a drain on the wallet too! Having a lifespan of around twenty years, the RedTail Catfish is a big responsibility and not one that should be undertaken lightly. If you have decided to keep a RedTail Catfish, and I can’t blame you if you have, you will need to ensure that they have the correct setup aquarium. A large sump filter system will be required with an external heating source. These catfish have been known to eat internal filtration and heaters and using them is not a risk you want to run. We highly recommend large external canister filters like the Fluval FX5 larger canister filter. We found the best prices over at Chewy.com and have provided you with a link to save you time. The decor is also a source of ‘entertainment’ for these fish, so either keep it to a minimum or ensure that it is too heavy for the RedTail Catfish to move. You will need to provide hiding spots for Red Tails especially if you do not use subdued lighting which they far prefer. Caves, dens, large branches or big rocks are all ideal items for your RedTail Catfish to hide amongst. Although they are a fairly hardy fish, it is still important to keep the RedTail Catfish aquarium within the recommended parameters. Water changes and maintenance should be performed weekly with 30% of the water being exchanged. Should, for any reason, the water in their aquarium have problems or deteriorate your RedTail Catfish will let you know by swimming to the surface and gulping at the air. As a juvenile it is recommended that you feed your RedTail Catfish every other day, but as an adult just once a week. They are omnivores with a hearty appetite who can be very sluggish after feeding. This is due to them taking their time to digest food. They are also one of the most common species to become obese due to being overfed by their keepers, the diet they require and their inactivity. 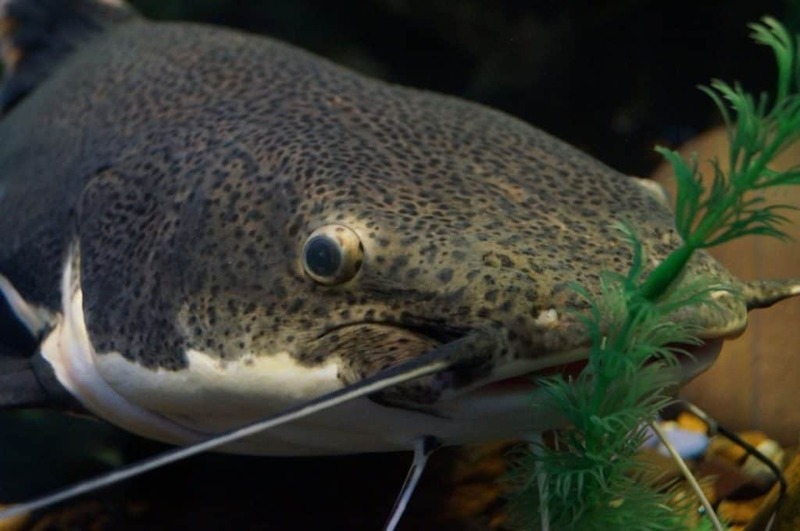 Healthwise the RedTail Catfish is subject to the same diseases and illnesses as other tropical fish with obesity-related illness and poor water quality diseases being most common. High nitrate levels, for example, can cause infected barbels/whiskers which will lead to the RedTail Catfish being unable to navigate and eat properly. Proactive prevention, as always, is the best course to take with RedTail Catfish illness but should yours fall foul to a disease it is vital you are very careful what treatments you use. Catfish are a scaleless species and therefore cannot tolerate any medications that contain potassium permanganate or are copper based. Malachite green/Formalin is, however, a suitable choice providing you only use a ¼ to ½ the recommended dose. 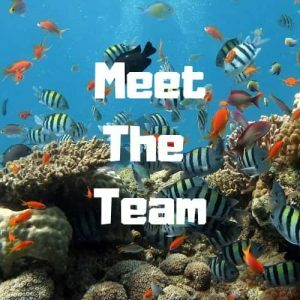 What do Redtail Catfish eat? 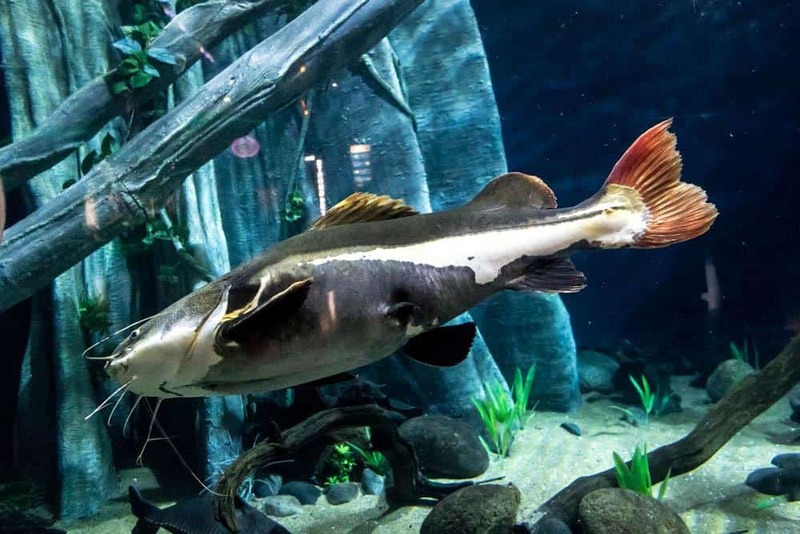 As an omnivore the RedTail Catfish in its natural habitat feasts mainly on fish, crab, and crustaceans with fruit and seeds making up the rest of their diet. They are opportunistic predators that wait for ‘food’ to come along, or in the case of fruit and seeds fall into the water. In captivity, RedTail Catfish require a varied and well-balanced diet to ensure that they do not become obese. As an already inactive fish in their natural habitat, they are even less active in captivity and the risk of overfeeding is high. This is why it is recommended that as an adult you only feed these giants once a week. There is a wide range of foods readily available that your RedTail Catfish will accept. It should, however, be noted flaked foods are only suitable for juveniles and that not all RedTails will accept flake foods. Larger food sticks like Tetra Jumbo Sticks will be accepted and sucked up from the surface in large amounts giving them all the nutrients they need from a staple food. Beef heart and chicken are also unsuitable for this species as some lipids these contain cannot be properly metabolized. This inability can cause problems such as excess fat deposits and even organ degeneration. Suitable foods, high in protein, include prawns, mussels, cockles, lancefish, earthworms, crayfish, and cut up fish. As they grow older a RedTail Catfish will also easily accept a whole white fish! Crustaceans, it should be noted, are fantastic color enhancers to bring out the red in their tails and veg should also be given on a regular basis to balance out their diet. You may be wondering why live feeders are not mentioned in the list of suitable foods for a RedTail Catfish! This is because, as though they are certainly a viable offering for this species, they can also be fraught with problems and are not a necessity. Many live feeders nowadays carry parasites and diseases and are bred in such numbers and conditions that they contain very little to no nutritional value. Although there have been some reports of success with breeding using hormones in South American fisheries, breeding in home captivity is thought to be impossible. This could be partly due to the Red Tail Catfishes territorial nature with its own kind and the inability on our part to be able to provide a large enough aquarium for them to cohabit. In their natural habitat, Red Tail Catfish are oviparous and breed in the same manner as many other catfish. This involves the preference for a certain water temperature between 75-80℉ or 24-27℃ and a place to nestle in the rocks and weeds. The female will then choose a spot that is secluded and easy to guard against predators and lay her eggs on a flat surface. An astounding number of eggs can be laid in one spawning, starting at a few hundred and going up to approximately 21,000! The younger smaller females tend to lay the lesser numbers, whilst the older and larger lay the most. Next, the male will spray the laid eggs with sperm to fertilize them, they will hatch within about ten days. It is not known whether either the female or the male guards the eggs whilst they are hatching but it is believed to be so. The male also will protect the fry for around a week before they up and leave the nest. Known as a territorial fish with its own species and other catfish in the Pimelodidae family the RedTail Catfish is best kept solitary. They can, however, make a good community tank member with other species providing they are of a good size and in an appropriately sized aquarium. Gars, stingrays, datnoids, black pacu, giant gourami and iridescent sharks all fall into the category of recommended tank mates. Shrimps, crabs, snails and other fish that are smaller all fall into the category of lunch! Sailfin and common plecostomus can also make good tank mates mainly due to their armored defense. It is recommended that RedTail Catfish and potential tank mates are raised together from a young age. Oscar’s also made good tank mate for the RedTail Catfish, just make sure they are a good size! There is absolutely no doubting that the Red Tail Catfish is one of those fish that many would love to own. This is especially true of those fish keepers who thrive on keeping the so-called ‘monster fish’ that others can only aspire to own. It has to be said though and it can’t be said too many times, that to take one of these spectacular catfish on you have to have the correct setup and set up size. You also need the money to fund this and the Red Tail Catfishes voracious appetite. With a lifespan of around twenty years, it is going to be one expensive food bill! Having said all that, however, if you have got the funds and the means, the Red Tail catfish really is a truly beautiful giant of the deep. I, for one, would happily keep one again, if only I had space!